Welcome to CPR's resource collection where you'll find tools and resources, such as videos, websites and reports, that cover a range of topics relevant to our campaign to end discriminatory and abusive policing. How to use the filter feature: To view more than one topic or resource type at a time, hold down the Ctrl/Command key while selecting the items of your choice. The Safer New York Act is a package of bills in the New York State Legislature that would help increase police transparency and help increase accountability to New Yorkers' most common encounters with police. The Safer New York Act includes the Police Statistics and Transparency (STAT) Act, codifying and strengthening the Special Prosecutor executive order, reducing Unnecessary Arrests for low-level, ticketable offenses, and repealing the NYS police secrecy law (CRL section 50-a). It's been 5 years since Ramarley Graham was shot and killed by NYPD Officer Haste in his home, in front of his grandmother and younger brother. Read & share these EIGHT FACTS about Ramarley’s case and stand with his family to demand NYPD accountability. Mayor de Blasio & NYPD Commissioner O'Neill must fire Officer Haste and the 12+ other officers who abused Ramarley's family and engaged in misconduct surrounding Ramarley's killing. Learn more and get involved today at www.riseup4ramarley.org. In July 2016, the New York Times reported that NYC Council Speaker Melissa Mark-Viverito had agreed to a deal with then-NYPD Commissioner Bill Bratton in an attempt to prevent a vote on the Right to Know Act. The deal removed some of the most important protections of the Right to Know Act, including policies explicitly prioritized by the White House Task Force on 21st Century Policing, and its underlying foundation of accountability. The following fact sheet includes some of these key distinctions and further demonstrates why the NYC Council must pass the Right To Know Act to ensure meaningful and lasting reforms to protect all New Yorkers. In 2012, NYPD officers busted into the home of 18-year-old Ramarley Graham without a warrant, and shot and killed him in front of his grandmother & 6-year-old brother. It's been nearly 5 years since the killing, and Ramarley’s family still has no answers and there has been no accountability for the 12+ officers involved in the misconduct related to his killing. 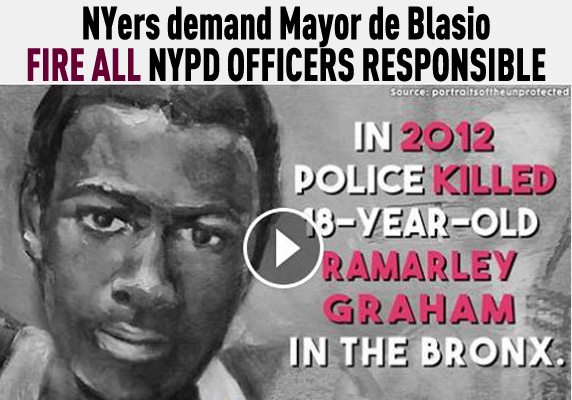 Watch Ramarley's story & stand with his family in their demand for accountability. La Ley del Derecho a Saber es un paquete legislativo que busca proteger los derechos civiles y humanos de las y los neoyorkinos a la vez que promueve la transparencia y la responsabilidad en las interacciones del día a día entre el NYPD y el público. CopWatchNYC.org ~ Protect Your Community. Watch the Cops. CopWatchNYC.org is a website to help citizens document police conduct and hold the police accountable. The site provides quick access to important Cop Watch tips, resources, support and best practices for individuals, organizations and teams of community members who want to safely and legally conduct Cop Watch in their communities. Know Your Rights! Help End Discriminatory, Abusive & Illegal Policing! The first step in protecting your rights is knowing them! CPR has developed a brief booklet to help New Yorkers of all backgrounds understand their rights when interacting with the police. Print copies are available through CPR member groups, or you can download it here.